Patreon shouldn’t work. It just doesn’t make sense that people would choose to pay someone each month….especially when it’s supporting content that is available for free anyway. I was sure that it was never going to work for me. But a brief conversation with Sarah Williams (from the Tough Girl podcast) convinced me I should give it a go. And I’m so glad I did! A year on from setting up my page I have almost 100 Patreons bringing in over $500 a month. So here’s what I have learnt over the last year and how to make money with Patreon. I guess the easiest way to explain Patreon is like a membership. Followers can choose to sign up to support you each month. You decide different levels of pledges and rewards that they get depending on how much they choose to give. My tiers are set up starting at $3 then $5, $10, $25 and $100. Patreon’s can also choose to set their own amount entirely and to not get any rewards in return. Another great feature of Patreon is it is no obligation. Patreon’s can cancel at any time and are completely in control of the price they set as supporters. If the answer is yes then Patreon is for you. It doesn’t cost anything to set up a Patreon page. They take a small percentage from any pledges you get so signing up is completely risk-free. So really you’ve got nothing to lose. The first obstacle with setting up a Patreon will be getting over those negative feelings you are likely to have. The first will be the embarrassment that it might not work….especially as the page is so public. Then there will be that uncomfortable feeling that many of us have when it comes to asking for money. This was something I had to get used to quickly as I began to create a career for myself. It is ok to ask for money to pay for the time you put into things. Don’t be ashamed of that! If you haven’t already I can really recommend reading the Art of Asking. It will help you view value in a different way and help with that fear of asking for money. Another thing that makes Patroen great is that it is transparent – it makes money and spending very black and white. Consumers appreciate this! Spend some time on the wording you put on your Patreon page and be completely honest. Explain exactly what you are hoping to get, how much time you put into doing what you do and what Patreon money will pay for. If the goal is that it will be a salary for you then say this – explain that you want to work on this full time. You can choose if you want to show how much you earn as a Patreon or not. It doesn’t take much for someone to look at how many pledges you have and work out a rough estimate of what you are earning. So the way I see it is why not keep that transparency and just share this in the first place. Be an open book for your followers. 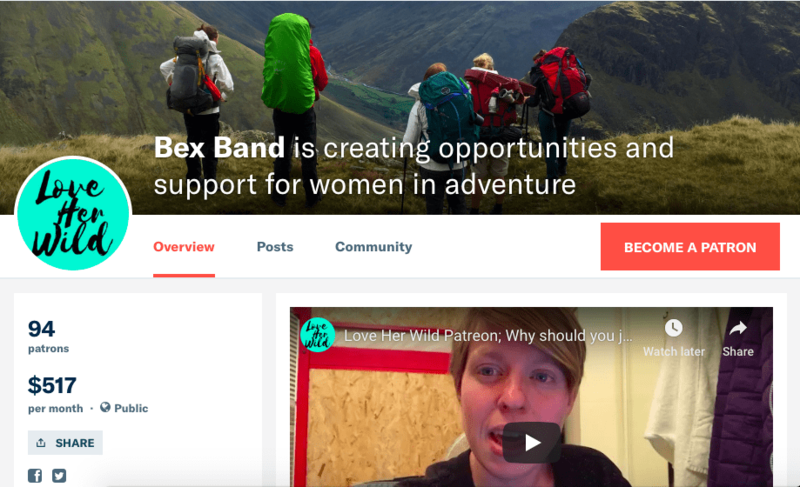 Make the most of all of the features on the Patreon page. I think it’s really important to include lots of photos representing you and your work. The goal setting also helps to demonstrate what you are hoping to achieve and gives a target for followers to help you achieve. I want to put special emphasis on the video feature on Patreon. It sits right at the top of your page, the first thing someone will see. When I made a Patreon video my rate of sign-ups increased. Why? Because a video is the most personal direct way of reaching your audience. I introduce myself, my work and explain up front why I hope they will be my Patreon. Initially, I put a lot of effort into thinking up rewards for different tier options. I’ve come to realise though that I think this is secondary when it comes to people signing up to be a Patreon. In most cases, I’d say that feeling of connection and wanting to support you as an individual is a far greater draw than getting a free video once a month, etc. I set my rewards too high initially and shot myself in the foot because fulfilling them then used up a chunk of the money I was bringing in. Don’t offer too much or promise gifts that relative to the money you are being given is too high. And don’t forget to include postage when you weigh this up. Great….you’ve got a page set up and are ready to go. Now it’s time to start growing your numbers. For my top tips check out how to get more Patreons. If you need some more inspiration from other Patreon creators you can see some examples on this page and also here. While it’s good to learn from others I’d also say Patreon should be a personal reflection so make sure it comes from you. I hope these tips on how to make money with Patreon have been useful. Patreon for most is a slow and steady progress but if you tap into it’s potential the outcome really is incredible. It has allowed me to keep doing what I love and to help others without needing to rely on branding and advertisements. Do check out my own personal Patreon page and if you have any questions ask away in the comments box below.